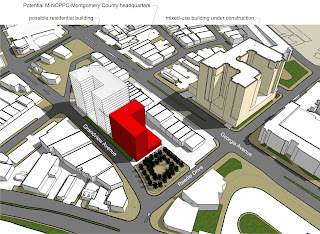 Talk about walking the walk; Montgomery County planners may promote the redevelopment of Wheaton they have been pushing by moving their own headquarters to downtown Wheaton. The county council approved a redevelopment plan last month that would build a new 150,000 square foot headquarters for M-NCPPC at Grandview Avenue, Reedie Drive, and Triangle Lane, a site now used as a surface parking lot. The project would be financed by the county's Capital Improvements Plan. Financing sunk the planning department's previous attempt at building a new headquarters - the now-defunct SilverPlace. First conceptualized back in 2006, SilverPlace was to include 300 residential units, lush public greenspaces (below right), and the planning headquarters on 3.24 acres. Details were exhaustively worked out in conjunction with community members, only to falter when it came time for the county council to approve the financing plan. "On SilverPlace, we worked very hard with the community," recalls Dan Hertz, project manager at Montgomery County Department of Parks, who worked on the project. 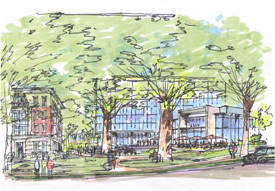 ""We wanted to respect concerns about an office building next to an existing neighborhood. The plan we came up with called for two wings; a low-rise next to the existing community, and then a taller component facing Crown Plaza. But we were going to fund it by borrowing money with certificates of participation (COPs), which had to be authorized by the county council. But there was concern about the recession, so it didn't get the votes." With the economy kinda sorta turning around now, has there been any talk of reviving SilverPlace? "No," says Hertz. "The county has been really encouraging us to go into Wheaton." And this time, the financing plan is structured differently, in such a way that the county council might find more much more palatable. "This new plan would be funded with general obligation bonds, which is like the county itself is taking on the debt." Wheaton, which has lagged behind the rest of MoCo despite a surplus of developable real estate and the presence of a metro station, has seen a major wave of redevelopment as of late. There were virtually no residential units in downtown Wheaton near the metro station before 2004; now there are nearly 700, with many more in the pipeline, from Patriot Realty's Safeway/residential project on Reedie to Washington Property Company's 221 units on the former site of the First Baptist Church of Wheaton, to B.F. Saul's Wheaton Triangle project that could potentially bring a million square feet of office/retail/hotel space to the area.